Is your cat pregnant and you really do not know what to do? 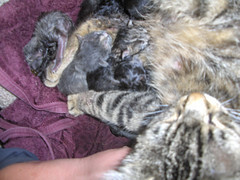 Do you wish that you had some knowledge about pregnant cats, but do not know where to find it? Now your search is over, because you will find everything you want to know about expectant cats in this report “The ABC’s of Cat Pregnancy.” Starting from the first beginning signs, right up to labor and delivery, it is all here in this short yet informative report. At only 6 pages long the report is easy to read and understand. You will be able to read through it in less than an hour. You will learn the common signs of pregnancy and how to deal with them. Knowledge is power and when you read this report it will enable you to stay calm and collected, through your cat’s entire pregnancy.